National Council for Hotel management and Catering Technology (NCHMCT) has invited applications for NCHM JEE 2015 in an online mode. Candidates who are interested in filling NCHM JEE 2015 Application Forms need to go through the application procedure before filling in the online applications. How to fill NCHM JEE 2015 Online Application Form is a step-by-step guide for filling in the applications without mistakes and in an easy way. Guide to fill NCHM JEE 2015 Application Form will help you to fill in the online applications by following the below given steps. 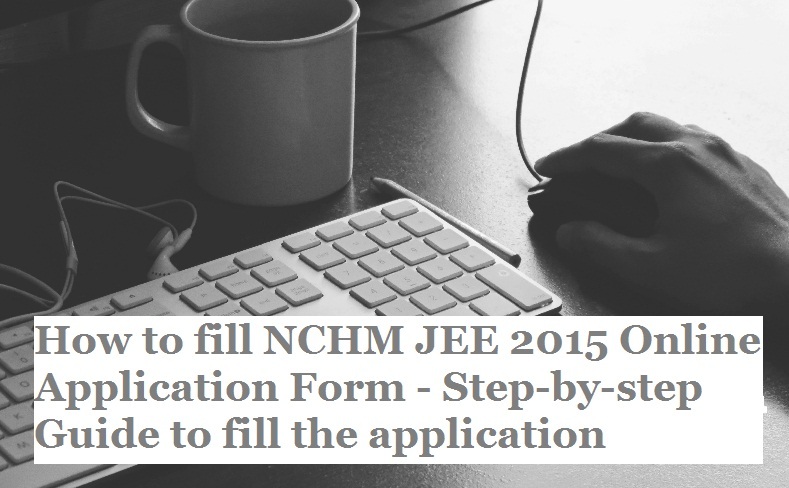 Candidates will need to follow the instructions and Apply Online for NCHM JEE 2015 Application Form. NCHM JEE 2015 Applications have begun from December 10, 2015 and can be filled in till April 6, 2015. NCHMCT is conducting NCHM JEE 2015 on April 25, 2015. Candidates will need to choose either of the mode, Online or Offline before filling in NCHM JEE 2015 Application Form. Candoidates can either apply in online mode using Credit/Debit Card or can apply offline through Demand Draft. As you proceed to the next page, you will be redirected to ‘Application Guidelines’ page, where you need to go through the application process of NCHM JEE 2015 Application. After reading the entire guideline, click on ‘Click here to APPLY ONLINE’ button at the bottom of the page to proceed to the application page. After filling in the above details in NCHM JEE 2015 Application Form, click on ‘Proceed Next’ button after checking the box of ‘Declaration’. In the fourth step, you need to remit your NCHM JEE 2015 Application Fees, after verifying the details as furnished by you. You’ll need to provide Name as on your Debit/Credit Card and contact number. After providing these details, click on ‘Pay Now’ button to remit the application fees. However, if you wish to go to the previous page and make any changes in your filled in NCHM JEE 2015 Application, click on ‘Back to Edit Application Form’ button. Choose your preferred card type, amongst VISA, Master Card and Maestro, by clicking on it. Provide your Credit/Debit Card Details and click on ‘Pay Now’ button to remit the application fees. After the payment has been received by the bank, you’ll receive confirmation at your registered mail id. You’ll need to take a print out of the filled in NCHM JEE 2015 Application Form. Congratulation! You have successfully filled NCHM JEE 2015 Online Application Form, without any errors and an easy way. Now you’ll need to dispatch the filled in NCHM JEE 2015 Application Form to the below mentioned addressafter affixing your recent passport size photograph and signing at the designated place in the application.